Pew issued a new report on the State of the News Media report detailing the good news – and the bad news – about the news. The explosive growth over the last year at digital native sites includes a wealth of top-name journalists, but the biggest group of journalists – some 38,000 – are still employed by the newspaper industry, and their ranks have decreased dramatically in the last several years. 5,000: Number of full-time editorialjobs at nearly 500 digital news outlets. 16,200: Number of full-time editorial newspaper jobs lost from 2003-2012. More than two-thirds of total news industry revenue comes from advertising, the vast majority of which is tied to traditional print and broadcast forms. While TV ads are stable, newspaper print advertising has fallen 52% since 2003. $63-65 billion: Total incoming money supporting the U.S. news industry. 8%: Percent of that total coming from new kinds of revenue and investment streams like venture capital, philanthropy, conferences and digital marketing services. A massive growth in local TV acquisitions has resulted in more stations sharing newsroom resources. 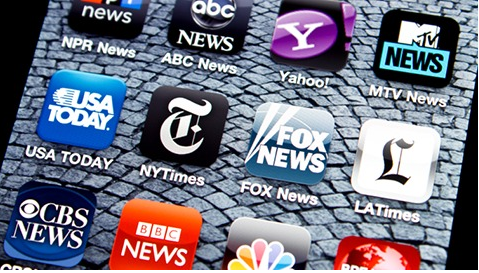 A quarter of local TV stations now do not produce their own original news content. 290: Number of full-power local TV stations that changed hands in 2013, up from 95 in 2012. 25%: Share of the 952 local news stations that do not produce their newscasts themselves. Growth in mobile and social as well as improved technology has spurred interest in watching – and creating – online news videos. Though growth has slowed somewhat in recent years (27% growth from 2007-2009 versus 9% growth from 2009-2013) , developments here are clearly creating more opportunity for consumers to be part of the news process. 36%: Share of U.S. adults who watch online news videos. 12%: Share of social media users who have posted their own videos of news events on a social networking site. Digital video advertising, though, may not be a sure win for news. Dollars here are growing, but still only account for about 10% of total digital advertising. And big, non-news players are quickly moving in, making it harder for news organizations to find a piece of the pie. $4.15 billion: Estimated 2013 revenue from digital video advertising, up 44% from 2012. 20.5%: Share of digital video ad revenue already captured by Google (through YouTube).